A hands on guide for Ruby newbies to create and publish their first Ruby gem. 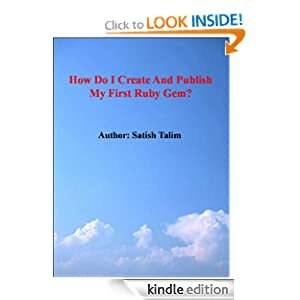 Satish has published a booklet that takes you through the steps required to publish your first Ruby Gem. Recently updated with information on how to ‘yank’ your gem in case you don’t need it to be available, it is a good short reference to get you quickly started in the world of Ruby Gems. There are tools out there that do the work for you in terms of having a skeleton. This booklet will cover none of those. It will take you through the basics to get a gem up and running in a few short minutes. Yes, all the information is available for free. And it is not that difficult to find it all. But dropping a dollar to have a handy reference on your Kindle to support Satish’s efforts on RubyLearning is just a small way to say “Thanks!” and a way to show some love.